The Community Water Model, developed by the IIASA Water Program, assesses water supply and demand at global and regional levels, and includes provision for healthy aquatic ecosystem. The hydrologic model is open source and can be linked to other models, enabling analysis of many different aspects of the water-energy-food-ecosystem nexus. Rising population and growing economic development mean that water demand is expected to increase significantly, especially in developing regions. At the same time, climate change will have global, regional, and local impacts on water availability. Accurate assessment of water supply and demand is therefore vital, and must take into account both human water use and the amount needed to maintain healthy aquatic ecosystems. The Community Water Model will examine how future water demand will evolve in response to socioeconomic change and how water availability will change in response to climate. The model has been developed to work at both global and regional levels at varying spatial resolutions, and the fact that it is open-source means that it provides a service to the water research and management community worldwide. In addition, it is flexible enough link to further planned developments such as water quality and hydro-economic extensions to the model. In this way, the model will provide a basis to develop a next-generation global hydro-economic modeling framework that can clarify the economic trade-offs among different water management options, encompassing both water supply infrastructure and demand management. The integrated modeling framework will consider water demand from agriculture, domestic, energy, industry, and the environment. It will also take into account the investment needed to alleviate future water scarcity, and provide a portfolio of economically optimal solutions. In addition, it will be able to track the energy requirements associated with the water supply system; for example, pumping, desalination, and interbasin transfer. To achieve these goals, the model will be coupled to existing IIASA models, including the Model for Energy Supply Strategy Alternatives and their General Environmental Impact (MESSAGE); the Global Biosphere Management Model (GLOBIOM); and the Environmental Policy Integrated Model (EPIC). Linking models for best results. MESSAGE: Model for Energy Supply Strategy Alternatives and their General Environmental Impact from the IIASA Energy Program (ENE). 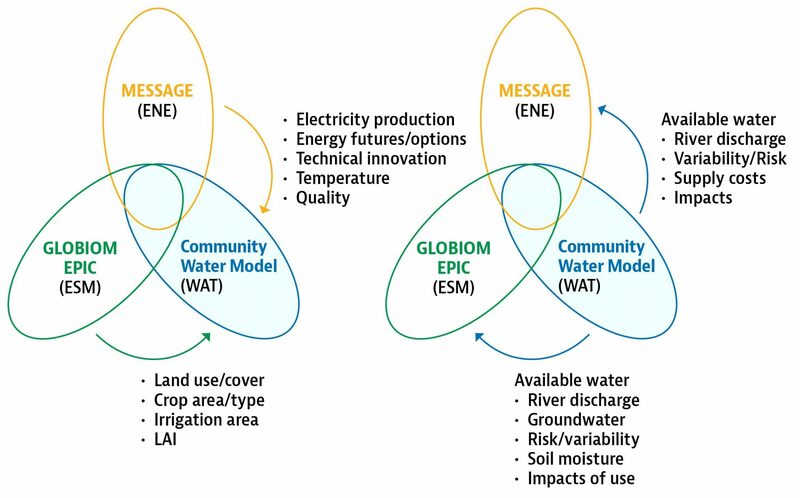 GLOBIOM: Global Biosphere Management Model and EPIC: Environmental Policy Integrated Model from the IIASA Ecosystems Services and Management Program (ESM). Community Water Model from the IIASA Water Program (WAT).